Guide price is per person. Based on 2 people sharing for 7 nights Bed and Breakfast. Flying from selected regional airports with year round departures. 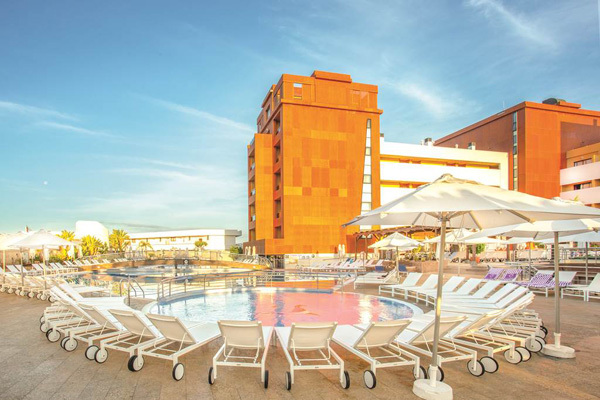 The Be Live Experience La Nina hotel enjoys a fantastic setting overlooking the beach at Puerto Colon in Costa Adeje. This stylish hotel is a hit with customers who love the fantastic facilities and activities on offer in modern surroundings. 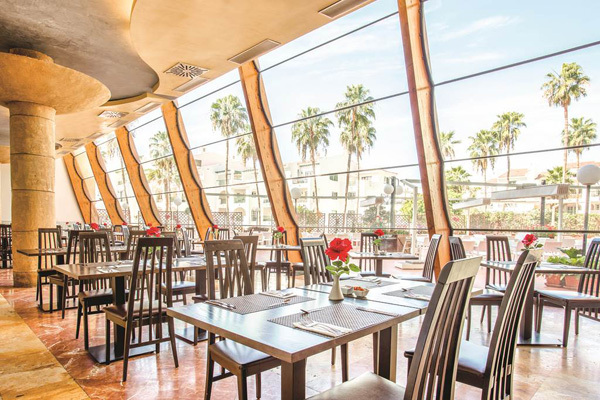 With a good selection of shops, bars and restaurants on the door step and the marina just along the road, it is a top choice for a base in this popular part of Tenerife. 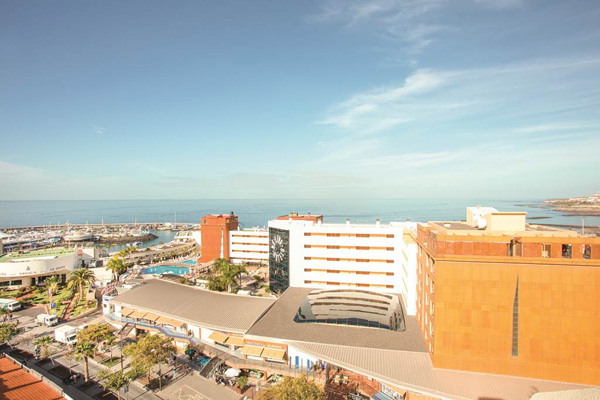 Location: 150m to Puerto Colon's sandy beach • 50m from the nearby restaurants, bars and shops in San Eugenio • 2km to the centre of Playa de las Américas. Board Basis: Ultra All Inclusive. Facilities & Activities Include: Two outdoor swimming pools (one climatised Nov−Apr), separated by a bridge • Kids' pool • FOOD & DRINK: International buffet restaurant with show cooking and grilled meat and fish everyday • À la carte restaurant • Pool bar • Lobby bar • Waterpolo • Archery • Gym • Hotel−run kids' club (4−12yrs) • Mini-disco • Playroom • Highchairs • Cots • Kids' menu • Frequent evening entertainment • Reception • Internet café • Wi-Fi. 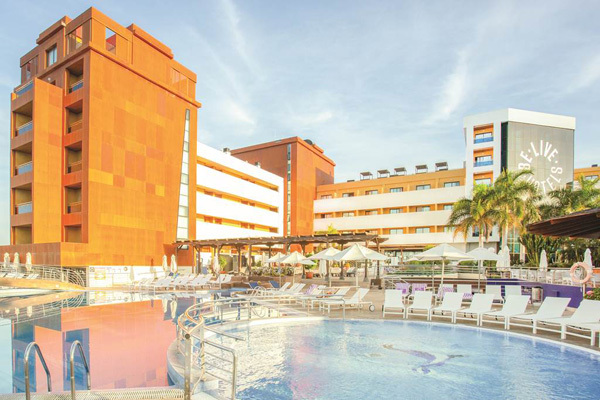 PAYABLE LOCALLY: Pool towels • Squash • Table tennis • Pool table • Massage • Sauna • Steam room • Turkish bath • Video games • Minibar • In-room safe • Room service • Bottled water • International drinks. PLEASE NOTE: smart dress code required at evening meals. Accommodation: There are 226 rooms. 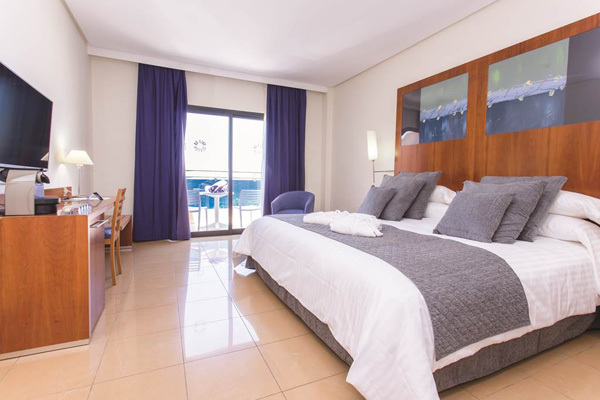 Standard rooms (two−three people) have twin/double beds plus extra bed, air conditioning, soundproof windows, blackout blinds, satellite television, Wi-Fi, full bathroom with hairdryer and a balcony or terrace. AVAILABLE AT A SUPPLEMENT: Sole use of Twin Rooms • Sea View Rooms • Family Rooms (two adults and two children) • Sea View Junior Suites (three adults and one child) • Adult Only Club Sea View Rooms are located on the 8th and 9th floors, with docking station, pillow menu, minibar stocked on arrival, coffee machine, personalised early check-in and late check-out (subject to availability) and use of exclusive areas in the main restaurant, sun terrace (with deluxe sunloungers) and VIP lounge with Wi-Fi, coffee machine, premium branded drinks, newspapers and snacks • Sea View Better Together Rooms, decorated for children with a games console, a gift for the children, a welcome pack in the minibar, Wi-Fi, tea and coffee making facilities, bathrobes and slippers for the whole family and up to three à la carte reservations per week (subject to availability). All Inclusive: Here are just a few of the package highlights: Buffet breakfast, lunch and dinner • A selection of internationally branded drinks • Drinks 7:30am-midnight • Snacks and ice cream available at selected times throughout the day • A variety of sports, games and activities • Regular evening entertainment including live music and shows • One visit per week to the à la carte restaurant • One free entrance to the spa per stay (minimun seven nights, during the two first days of stay).